We would like to introduce you to our Pan Abode Building System philosophy and our ability to create custom wood kit homes and buildings of quality, distinction, warmth and beauty. 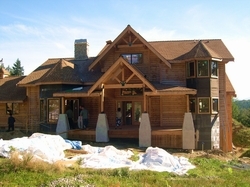 Pan Abode is a quality custom Kit Home and Cabin Building Systems company. Our systems eliminate on site waste and ensure consistent quality standards for your project. There is no guess work, all materials are consolidated, catalogued and carefully organized for maximum onsite efficiency. All you or your builder will have to do is put our system together eliminating onsite cost overruns and scheduling delays associated with custom home building. We design and prepare highly detailed construction plans incorporating state of the art engineered components. We consolidate the structural materials, cull to meet high quality standards, net cut for efficiency, manufacture components unique to specified Pan Abode building systems, and ship to tour site. We provide only Premium high quality materials. You will work directly with our design specialists and a broad range of building products and systems to create new home or building while gaining buying advantages through Pan Abode's mill-direct suppliers. Architectural Services included: Custom Architectural design & Home planning are included. Construction plans development & engineering to match your building site. Materials are quality assured, wrapped and protected for shipping & onsite storage. 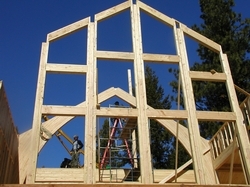 Construction supply documents direct efficient correct use of materials. Shipping and onsite coordination integrated with your building schedule. Technical Support - Customer Service Before, During, and After project completion. Pan Abode has been creating thousands of high quality homes and buildings, for worldwide sites since 1952. All of these feature wood systems and accents, particularly Western Red Cedar, one of nature's finest building materials. Through those 50+ years we have refined and added to our product line. Today we offer a choice of four primary structural systems and serve a full spectrum of full-time upscale home buyers, recreational second-home buyers, as well as commercial building projects. Pan Abode homes have been recognized worldwide for craftsmanship, ease of construction, quality premium materials and renowned customer service. We look forward to the possibility of working with you. We welcome an opportunity to earn your business.